However, not everything fits a chronological text structure. Eventually, students will compare and contrast ideas or write about the multiple facets of a bigger topic or state an opinion followed by supporting reasons. Each of these types of writings also requires transitions, but the connections are no longer sequential. Consequently, first, next, then, last will no longer suffice. 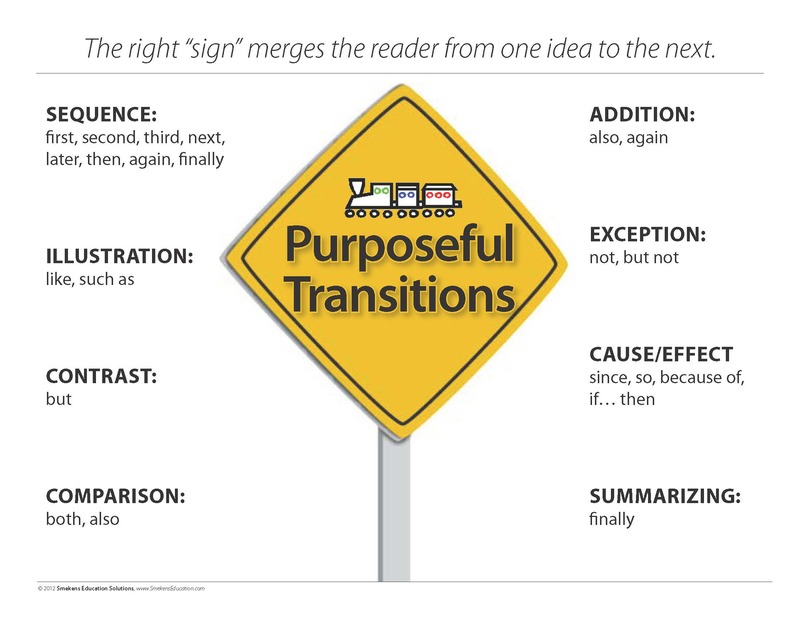 Transitions do more than just connect paragraphs. They define how individual sentences are related to one another. Think of them like road signs, alerting the reader to the kind of information coming next. 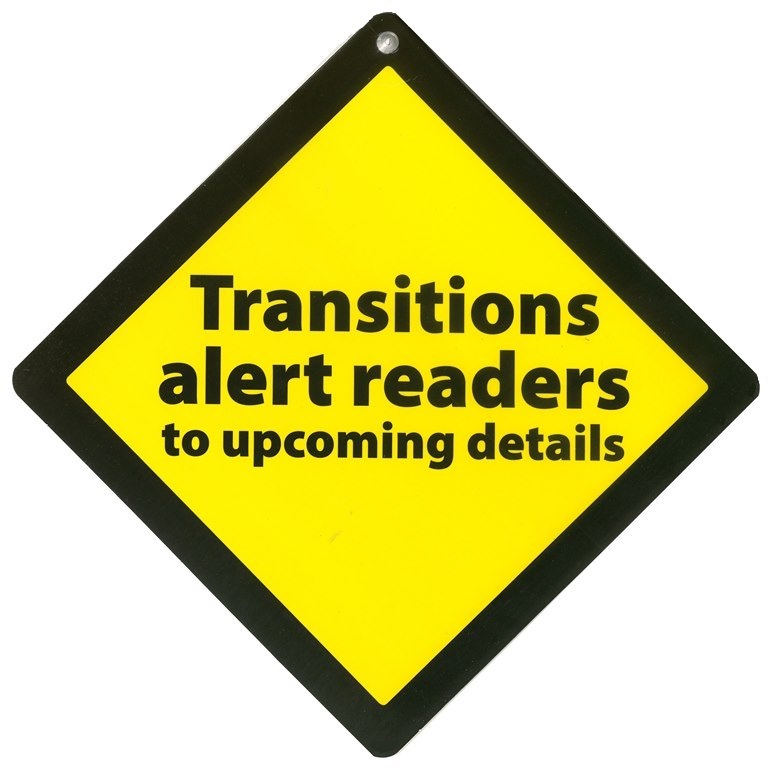 Transitions signal to the reader the kind of information coming. Writers need to prepare their readers for a shift in ideas. Check out this middle example about babysitting and an elementary example on Native American living. 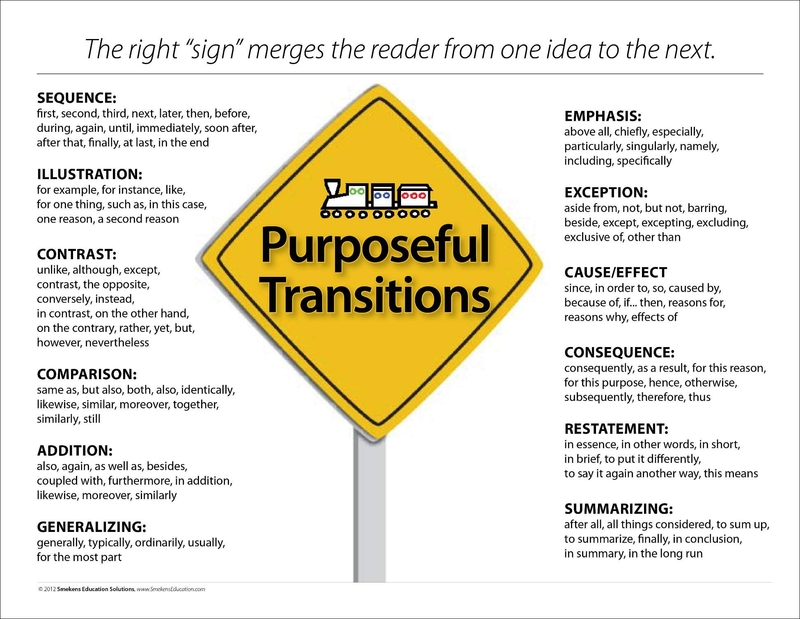 Provide students a list of transition words/phrases organized by purpose. 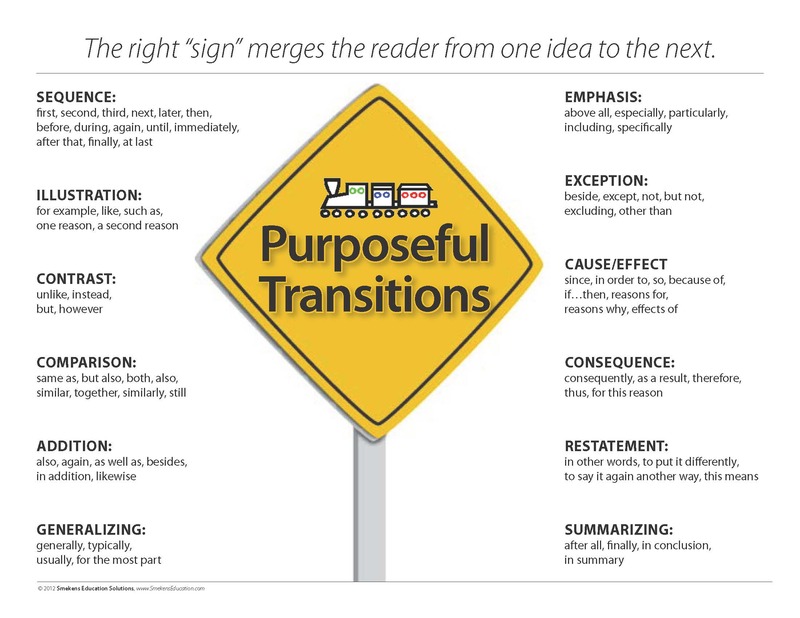 This makes it possible for students to choose the right transition to show connections. Model how to choose which category should be used. To do this, provide two-sentence combinations and then think aloud about how the ideas are related. It's all about the context. Read aloud the first example. Those two sentences are depicting two students acting differently. Now I look at my sheet, and I find a category that fits that. They are contrasting details, so I should choose one of those examples. Read aloud the second example. The first sentence was about watch dogs, and the second sentence is more about watch dogs. It's basically saying the same thing again. As I look at the list, I'm thinking it's a restatement. Read aloud the third example. The first sentence is about Babe Ruth being a good pitcher and a good batter. The next sentence is an extra something about just the batting. This extra info is emphasizing something. Read aloud the fourth example. 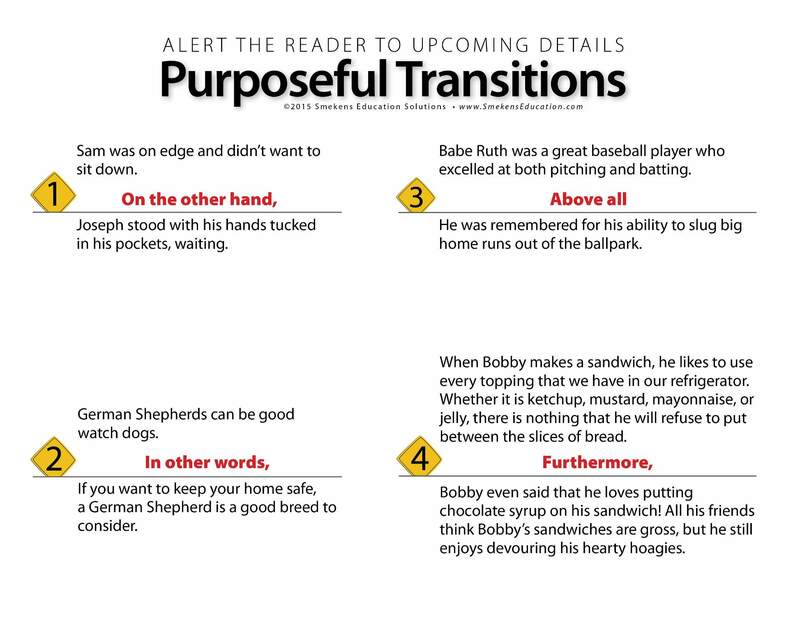 The first sentence describes all the things Bobby puts on a sandwich. The second sentence lists more. It's providing additional information on the same point. Transitions are essential to strong organization. They are what writers use to create a logical flow of ideas. 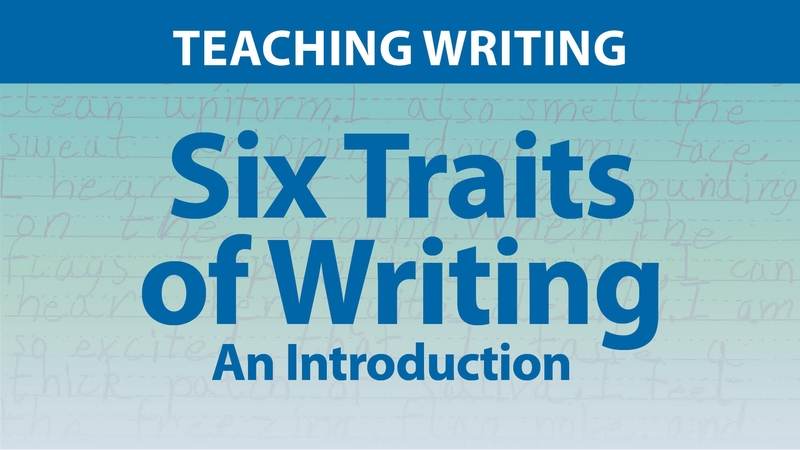 Be sure not to limit students' application of transitions to just connecting paragraphs or sections of writing. We want them to apply transitions within each paragraph, too.